Meet Narges Pouya – a woman on a mission to “be a voice for people who are voiceless”. She has been working as a Group Facilitator, Peer Educator, and Education Advisor in the Parvaneh Program, OMID’s Special Education Department in Tehran. As part of our Employee of the Month series, we sat down with Narges to get to know her and learn more about her career journey and crossing paths with OMID. Iran is host to one of the largest and most protracted urban refugee populations worldwide. According to the United Nations High Commissioner for Refugees (UNHCR) Iran, as of 2017, there are 979,525 registered Afghan nationals living in Iran. Narges is one these refugees and her story is one of survival. AA: Tell us about your background and how you were first introduced to OMID? NP: I am of Afghan descent but I was born in Iran. My family migrated outside of Iran leaving me here on my own. Naturally, being neglected by my own family took its toll on me but, at the age of 20 at depths of despair, I found hope. I was referred to OMID through UNICEF and in 2013 I entered the OMID home under the organization’s care where I then enrolled in the OMID Program. From the very beginning, OMID provided me with a safe environment to think, learn, and expand my understanding of my own behavior and attitude. I could feel myself changing for the better. For example, I began to understand why I acted out and behaved aggressively – as a result of being neglected as a child. Eventually, I became stronger and shifted my focus to making a peaceful and comfortable life for myself. From there I had the opportunity to follow my long life career aspirations: the arts, particularly theatre and acting, and helping people. AA: Tell us more about your journey towards empowerment and the transformation from being an OMID service user to now being an employee at OMID supporting and empowering marginalized women and girls? NP: During the 2.5 years that I was enrolled in the OMID Program, day by day my knowledge and skills on becoming self-reliant and resilient expanded. Through the support I received I realized what my life goals should be, and how I could build a path towards them. My biggest dream was to help those who have suffered abuse and don’t have a voice. After completing the program, I was given the opportunity to continue training in the OMID Peer Education Program, where I worked as co-facilitator for six months after being promoted to Assistant to Group Facilitator. Two years later, I am now the Education Advisor in Parvaneha. Given my passion for the arts and continuing education at university level, last year I applied and got accepted into Islamic Azad University Tehran Center Branch, Faculty of Arts, studying performance art and acting, alongside working at OMID. AA: Speaking of the arts, numerous studies have proven art therapy to be effective in helping those struggling with the after-effects of abuse, particularly when the survivor is unable to discuss their experience verbally. As I understand, art therapy is also included at OMID. Was it this exposure to the arts that helped you find your passion for the arts? NP: Through live performance, I have found a way to express myself, figuratively pulling myself out of a dark pit of isolation.On stage, I felt alive again. I chose to study performance art because I hope to be able to one day use this medium as a platform to increase awareness and make the voice of the voiceless and marginalized heard. I want to give women and girls who have experienced abuse the same opportunity I was given – to feel alive again. I believe I can do this by running workshops and working closely with survivors. For example at OMID, we offer art workshops and art therapy in the Parvaneha Program, a specialist Program at OMID specially devised for young women with extreme traumatic pasts. These women require individualized therapeutic support, and help with adapting and integrating with others. I view theatre and performance art as my way of starting a dialogue with people. I am passionate about using this opportunity to pass on the skills and knowledge I have been so lucky to acquire. AA: What has been your favorite project that you have worked on at OMID? NP: The opportunity to join the OMID Peer Education Program has been so fulfiling because it broadened my perspective and it was a very exciting experience. The moment I realized the impact of working on this project on myself was when I saw how I was influencing change on the young women in the Parvaneha Program. I was helping to give them hope to live and the future. Like these girls, before OMID, I had lost all hope in living. Today I am able to help others find hope and to be part of the journey of helping others become self-reliant through empowerment. AA: What does a typical day at work at OMID look like for you? NP: It starts with checking my emails in the morning, then getting together with the girls in OMID’s Parvaneha Program. Diba and I then facilitate group discussions. Following the group work, I provide assistance to the girls with their individual tasks. I then facilitate our Beyond Trauma workshop which takes us through to lunch break. Some days in the afternoon we have staff meetings, or some days we regroup with the OMID Parvaneha girls for extracurricular activities and report writing. Other days I help with any official paperwork that needs to be completed and follow up on educational plans and procedures. AA: What do you like to do in your spare time? NP: I don’t have any free time because I am at work from 8AM till 4PM, then I have University at 6PM until 8PM. On Fridays, which is our weekend here in Tehran, I am practicing theatre as I am currently taking part in a play. I have Saturdays off from work but that’s the day that I have University all day till about 6PM after which I have violin lessons. But, I enjoy the busy life I have made for myself as I work to achieve my goals. AA: What advice do you have for people wanting to join the OMID team either as volunteers or on our OMID Angel’s Program? Approach the work without feeling pity for the girls at OMID. Meaning, don’t hold the view of “oh I feel sorry for these women and girls because of the severe abuse and trauma they have been through”. Instead, hold on to our mission to support the women and girls so they can feel empowered. Create a peaceful and safe environment for the survivors to thrive in, and find their strength and feel empowered. Only then will they find their strength, become self-reliant and independent, and eventually be in a position to lead by example and influence and empower others. AA: If your life story was a book, what would you like the book to be called? NP: I need to think about that one! I think I’d like to call it “Just a day with me”. AA: And finally, what is the one thing that you want people to know about you? NP: I want people to know that I am an empowered woman. I have found the power within myself to engage in activities that bring me great joy. Because of this, I am closer to my ultimate goal to have a positive influence and help women and girls and other refugees. 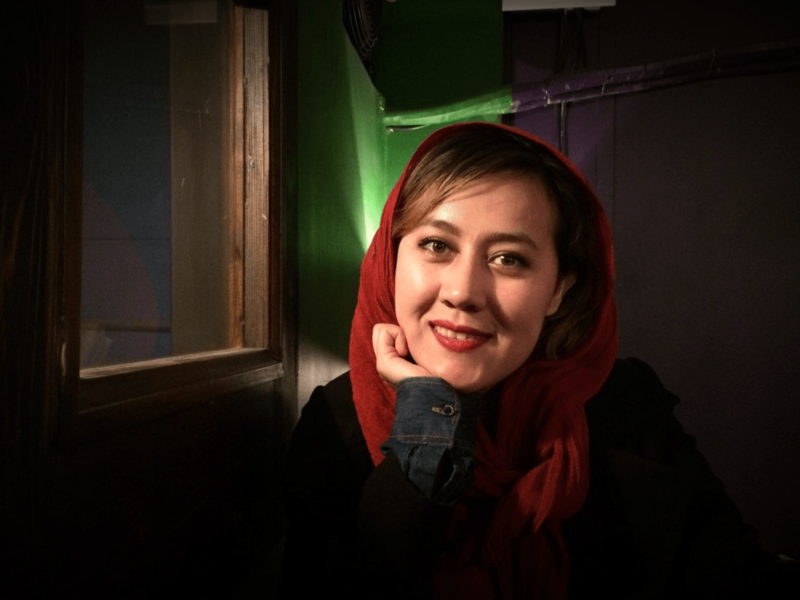 Narges is an Afghan actress, as well as an employee of OMID and one of the OMID girls who became successful in finding her place in Iran – against all odds. She is now to fulfill her career goals and is dedicated to a mission in giving back to the community and helping others.